Blurb: Sally is an incredible singer but she sings only in her wardrobe where nobody can hear her. She'd rather join a nudist colony than sing in public. 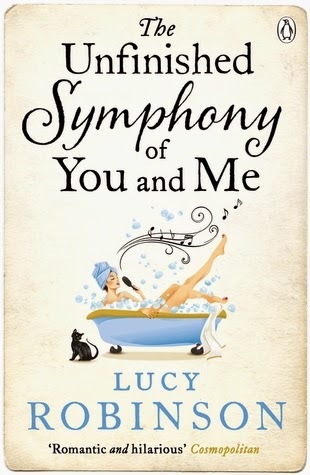 Review: I absolutely loved Lucy's debut novel, The Greatest Love Story of All Time, but with The Unfinished Symphony of You and Me, Lucy has completely blown me away. When I finished it some days ago, I thought this is one of the greatest books I have read this year, but now I am actually thinking this is one of the greatest books I have EVER read. I loved it from cover (which by the way is just perfection) to end. It was a unique novel written like an opera and even if I have absolutely no idea about opera, I have ended up loving this world immensely thanks to Julian and especially Sally. As we start reading the book we learn that something horrible happened one year ago in New York to Sally, her best friend but also cousin Fiona and Julian, the love of her life. But after that, they all have parted ways and Sally is back to London to fulfill a promise: she is going to go the conservatory and sing in public. From that moment, we learn little by little all about Sally's life, her struggles with her parents when she was a kid, her love and support for her wild cousin, her fears, her dreams and her secrets. The opera structure, with its acts and scenes, works perfectly and you find yourself devouring the book for hours. Sally is a character I instantly warmed to and I totally got her. That she would sing in her wardrove for fear of being heard was just genius. I could imagine her, as a little girl, in her wardrove singing like there was no tomorrow. But during the book she becomes a better version of herself and we have the privilege to do it with her. I was so proud of her at the end! And what about Julian? He was the cutest. Since we met him in New York, I could sense he was someone special and they had the perfect connection, you could sense their love for each other. Even after their separation and his betrayal, I just couldn't hate him. He was the piece of puzzle missing in Sally's life. As for the secondary characters, they were the cherry on top of this wonderful story. I especially liked Jan Borsos, who walked through half of Europe to get to London so he could attend the conservatory, he even lost one of his shoes in Paris! I mean, how can you not love him! He had a very special role in Sally's life and was one of the funniest! This book has so many layers. It handles some heavy topics like addiction, eating disorders or betrayal with such wonderful delicacy but at the same time Lucy makes you laugh until you snort. I'd say she writes an epic love story in an epic setting, the world of the opera. I completely forgot about everything else while reading this book and I felt like I learned a lot too. It makes you appreciate a new world, she writes with such a passion that as soon as I finished I begged my boyfriend to take me to the opera. All I have left to say is drop everything you are doing right now and get this book. As I said, it has become one of my all-time favourites and I will be re-reading it quite soon. Rating: 5 stars plus a little heart, meaning it has been one of my favourites so far!